English translation of the petition. If you haven’t already signed it, please do! 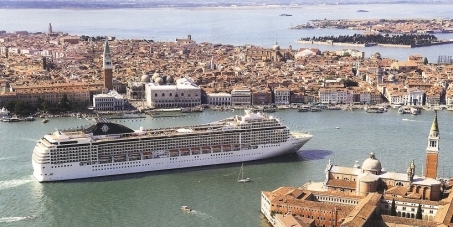 We are destroying one of the wonders of the world, Venice, for the profits of the few who want to bring in cruiseships that are double the size of the Titanic, with a devastating cost to the ecosystem, the embankments and threatening symbols, like St Mark’s Square, with the first wrong move. The Government is under pressure from the cruise lobby to give the go-ahead for the dredging of a new channel in the next few days. But following the resignation of the Infrastructure Minister, Lupi, the government must demonstrate that the era of large projects and large corruption is finished, that work against the interests of the citizens and the environment. The moment of truth will come on Sunday: Renzi will be in Venice. We must act immediately. Sign and share with everyone: once 100,000 signatures have been collected, we will hand the petition to the candidates for Mayor and President of the Region who will stand with him on the stage, until he agrees to withdraw the Government’s support for the project. Venice isn’t at risk from natural causes, but from speculation and environmental devastation caused by humans. We are asking you to choose to save it, stopping local projects that threaten its existence, starting with the dredging of the Contorta Canal, keeping large cruiseships out of the Lagoon, and making Venice a global symbol of the fight for the protection of the planet’s beauty, choosing a sustainable future for the city and 100% powered by clean energy.